More than 100 demonstrators walked in a line behind a truck with loudspeakers as police looked on, according to Reuters reporters at the scene. Bangkok: Anti-government protesters began marching in Bangkok on Tuesday from a university in the Thai capital to Government House to demand that the military government hold a general election by November. Government House and surrounding streets have been declared a no-go zone by police for the opposition march marking four years since a May 22, 2014, coup and have warned protesters not to defy a junta ban on public gatherings. Police set up barriers along some roads near the university and carried out security checks on Tuesday. One of the protest organisers, Sirawith Seritiwat, also known as Ja New, said protesters planned to march peacefully. “I hope they will let us walk out. We have no intention to prolong today’s activities. I think they will try to stop us … we will not use violence,” Sirawith told Reuters. Police said around 200 protesters had gathered. “Authorities will use the law 100 percent. If they walk out we will use the law immediately. We have put forces all around Government House … if they come in to these areas there will be a prison sentence of up to 6 months,” deputy national police chief Srivara Ransibrahmanakul told reporters. “Police have no weapons. They are carrying only batons,” he said. Activists complained of a military crackdown ahead of the gathering. On Monday, Sunai Phasuk, Thai researcher at the New York-based Human Rights Watch group, said two activists had been held incommunicado at a secret detention centre. “Their alleged ‘crime’ is providing loud speakers for anti-junta rally,” Sunai wrote on Twitter. The junta, known as the National Council for Peace and Order, is facing a public perception crisis, according to international and domestic polls that say corruption is as endemic as ever. The government has also repeatedly delayed the general election, which was first tentatively set for 2015, with the latest date now February 2019. Some fear the date could be pushed back again. Deputy Prime Minister Prawit Wongsuwan told reporters gathered at Government House the protesters were welcome to send a representative to the prime minister’s office. “The prime minister works hard … the NCPO these four years has worked everyday … All NCPO members have worked hard,” Prawit said. Suchada Saebae, 55, a market vendor, disagreed. “I came since 6 a.m. this morning because I think the NCPO has done a rubbish job these past four years,” Suchada said. Some protesters held Thai flags and others held signs with cartoons of Prime Minister Prayuth Chan-ocha as Pinocchio. 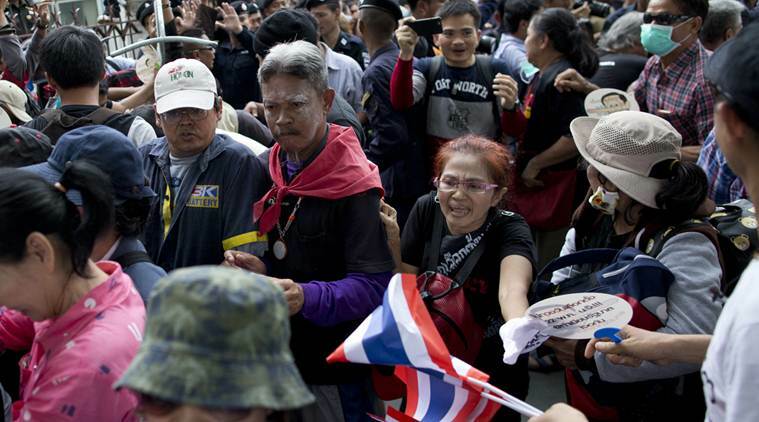 Protests against military rule have taken place intermittently in Bangkok since the start of the year. Some of them have been led by young activists. Others have been attended by former “red shirts”, or supporters of ousted former prime minister Thaksin Shinawatra, who was toppled in 2006 and fled abroad. His sister, Yingluck Shinawatra, was ousted in the 2014 coup and also fled abroad before being convicted in absentia of corruption. Thailand has been rocked by pro- and anti-government street protests for more than a decade, some of them deadly. The military says it carried out the 2014 coup to end the cycle of violence.